2 I. 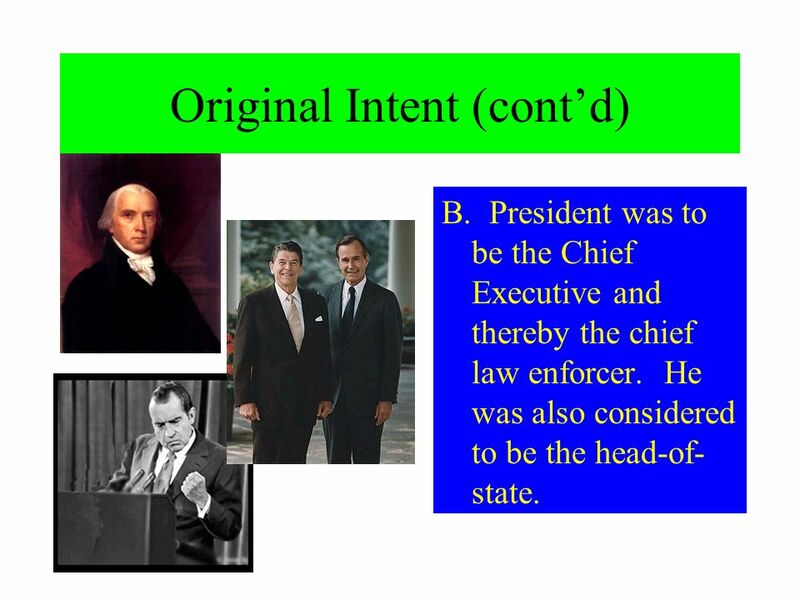 ORIGINAL INTENT A. 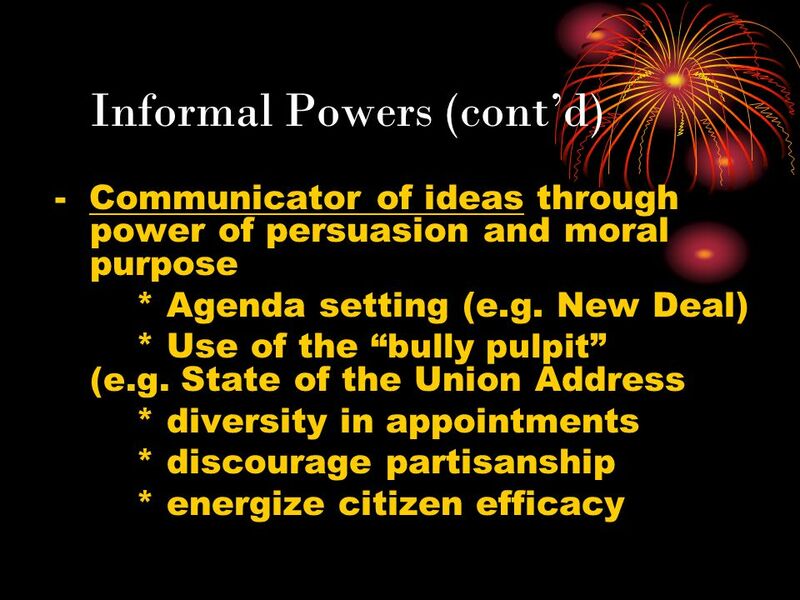 Founders wanted to create an executive branch with strong, but LIMITED, powers to support itself against the legislature, but also to prevent the rise of a powerful central figure. a. 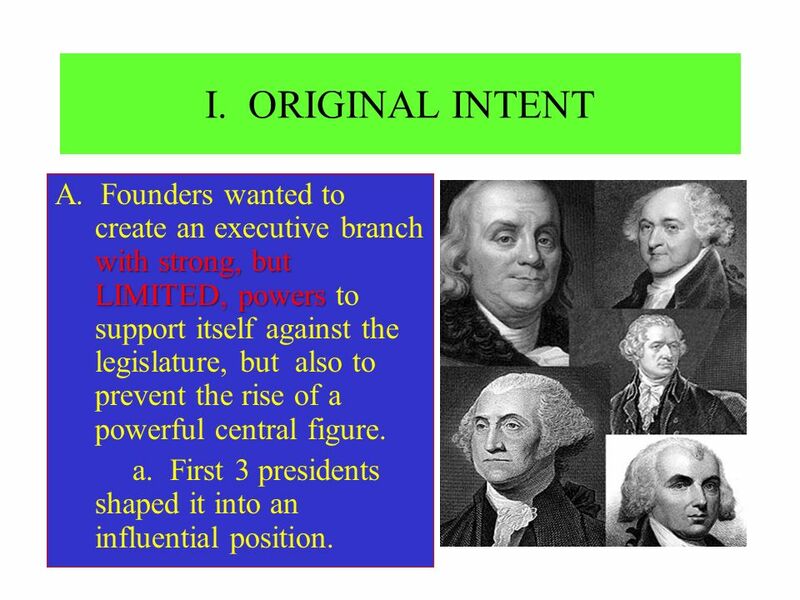 First 3 presidents shaped it into an influential position. B. President was to be the Chief Executive and thereby the chief law enforcer. He was also considered to be the head-of-state. 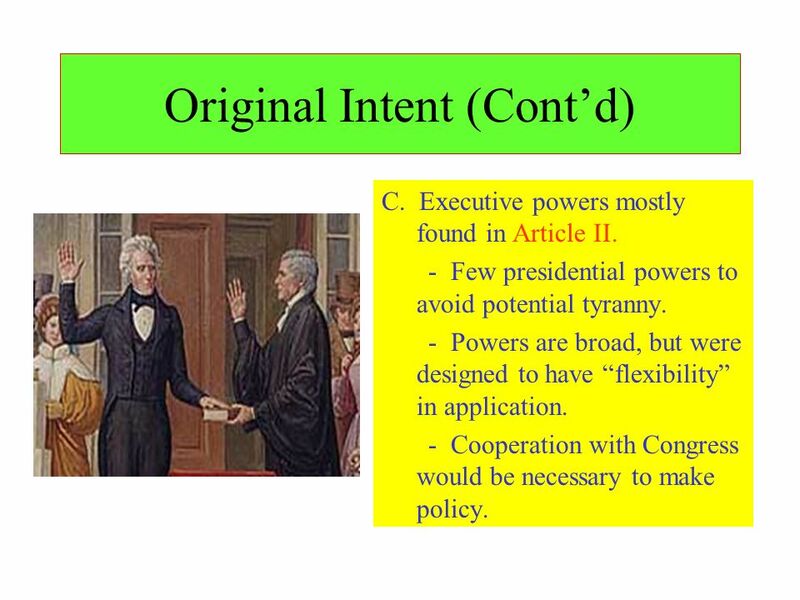 C. Executive powers mostly found in Article II. 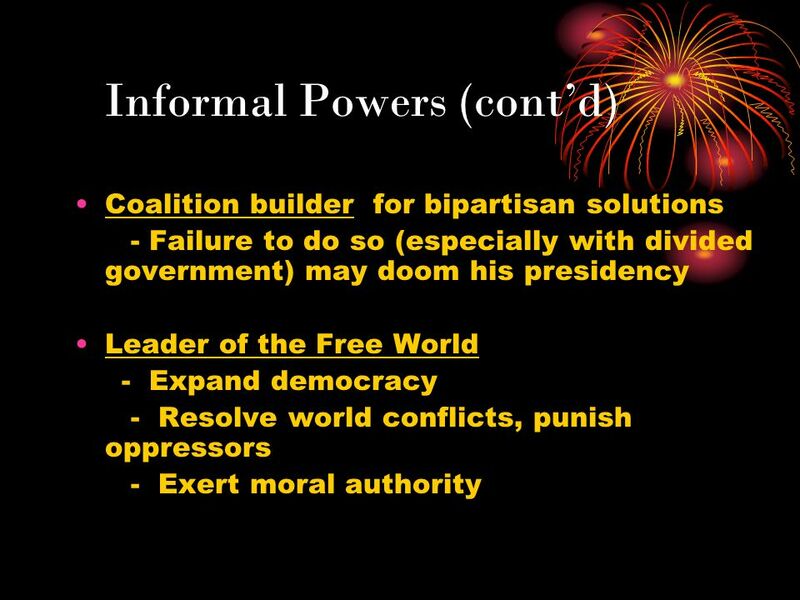 - Few presidential powers to avoid potential tyranny. - Powers are broad, but were designed to have “flexibility” in application. - Cooperation with Congress would be necessary to make policy. 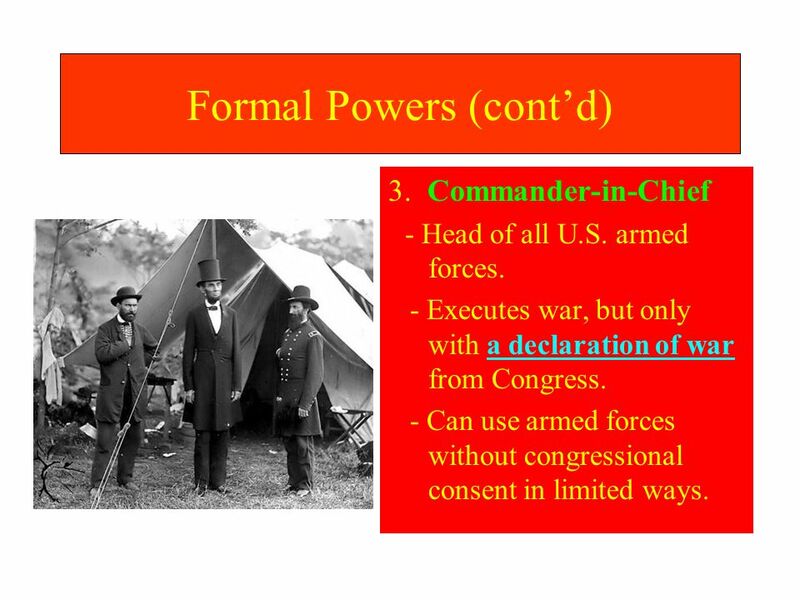 5 D. Formal Powers 1. 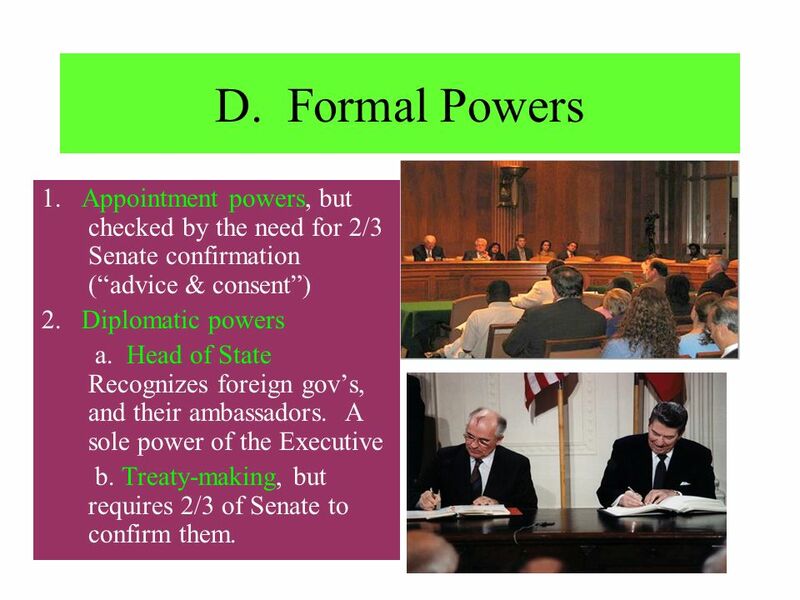 Appointment powers, but checked by the need for 2/3 Senate confirmation (“advice & consent”) 2. Diplomatic powers a. Head of State Recognizes foreign gov’s, and their ambassadors. 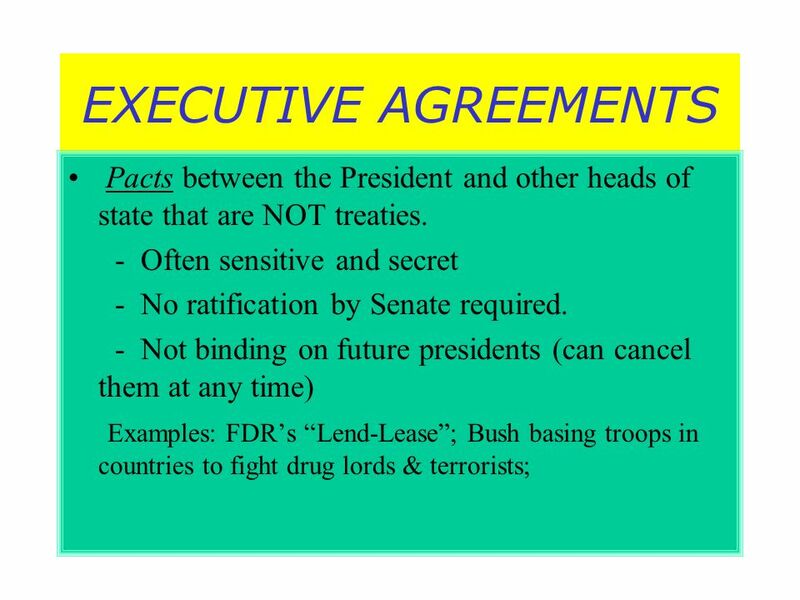 A sole power of the Executive b. Treaty-making, but requires 2/3 of Senate to confirm them. 3. 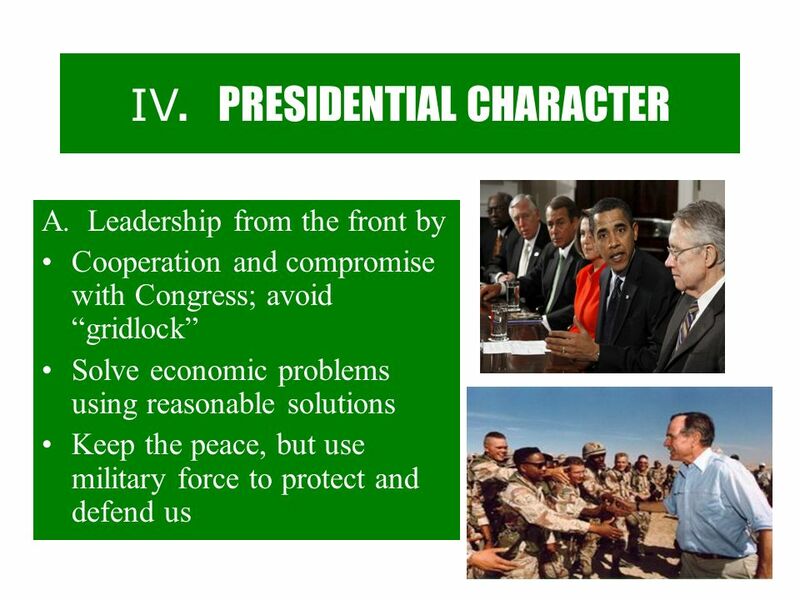 Commander-in-Chief - Head of all U.S. armed forces. - Executes war, but only with a declaration of war from Congress. - Can use armed forces without congressional consent in limited ways. 4. 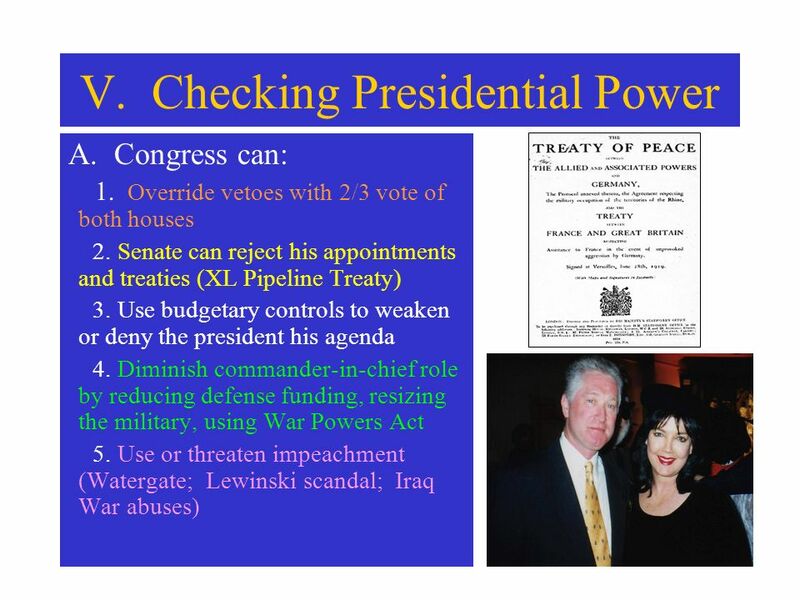 Veto power. Override by Congress is a check on him. 5. Chief Executive powers a. Grant pardons/reprieves for federal offenses with one exception: ____________ b. Sign bills into law and enforce them (the federal bureaucracy was created to assist in the latter). c. Can call Congress into session. 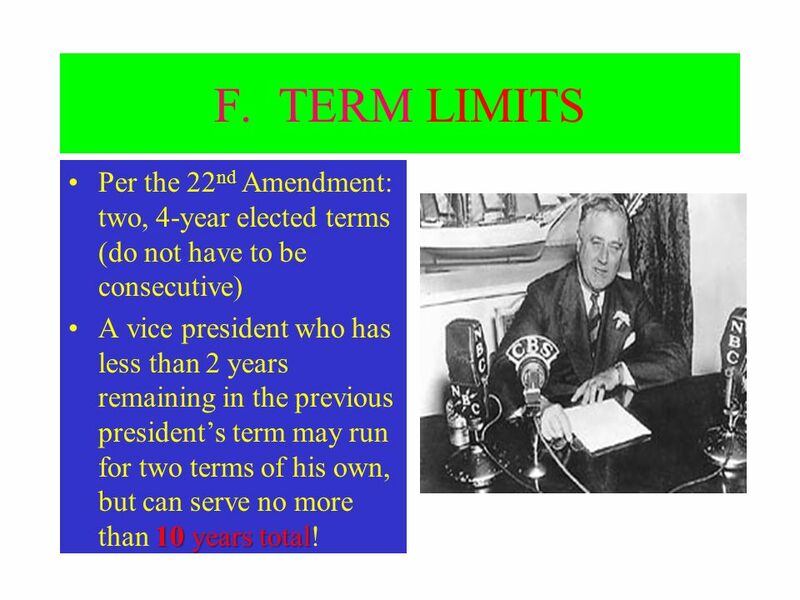 10 F. TERM LIMITS Per the 22nd Amendment: two, 4-year elected terms (do not have to be consecutive) A vice president who has less than 2 years remaining in the previous president’s term may run for two terms of his own, but can serve no more than 10 years total! A. 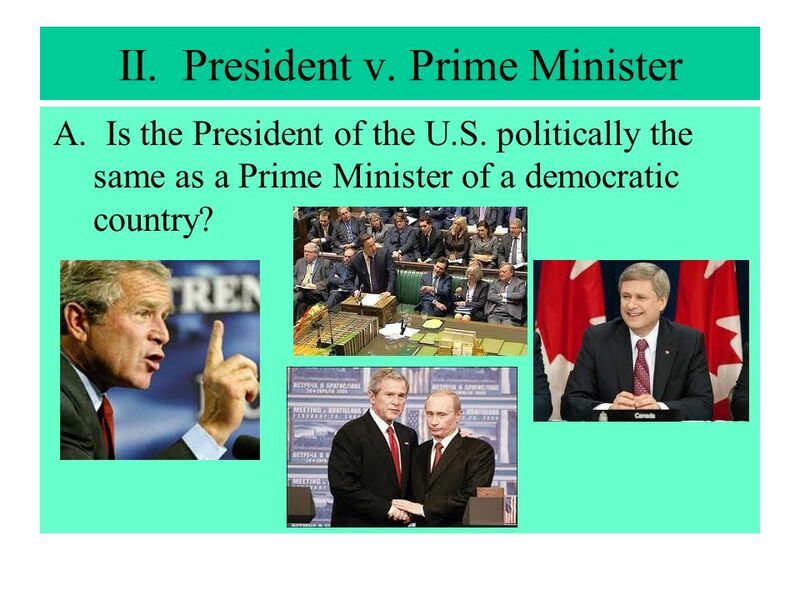 Is the President of the U.S. politically the same as a Prime Minister of a democratic country? 12 B. How do the two positions compare? 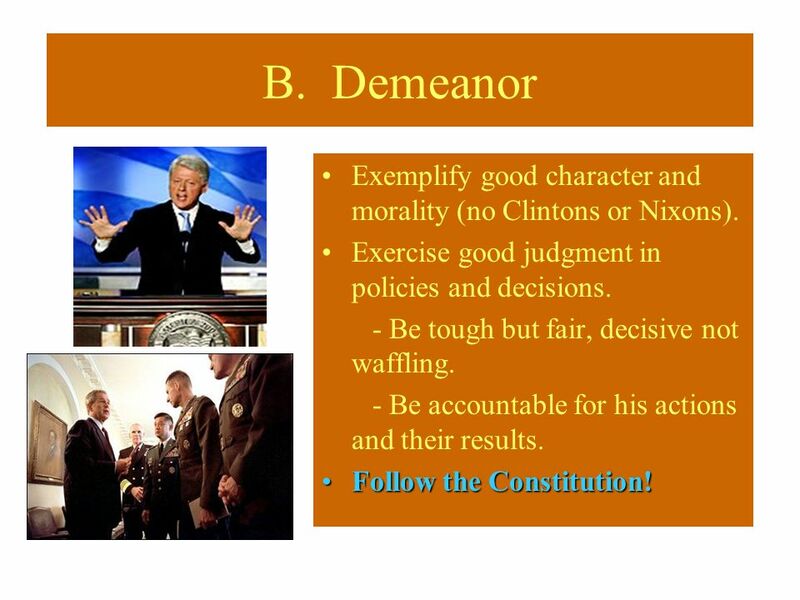 18 B. Demeanor Exemplify good character and morality (no Clintons or Nixons). Exercise good judgment in policies and decisions. - Be tough but fair, decisive not waffling. - Be accountable for his actions and their results. Follow the Constitution! 1. 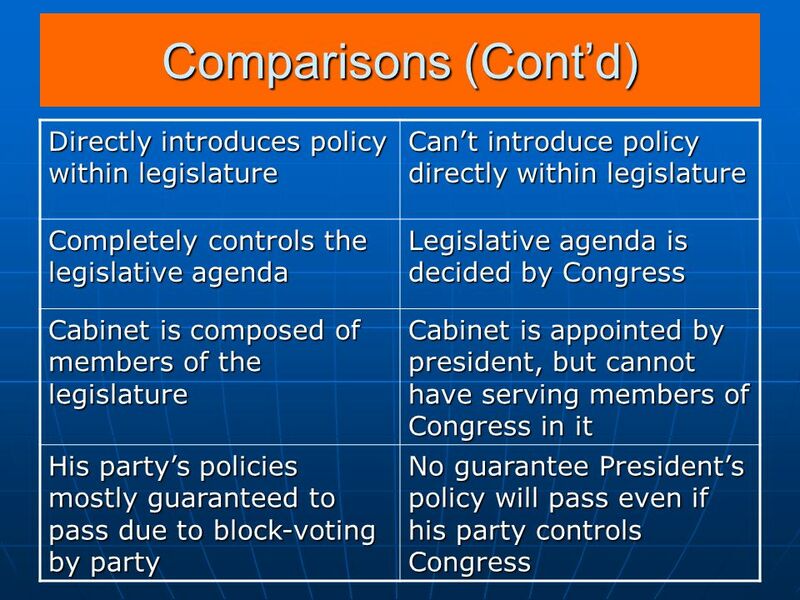 Character and policy can become blurred over time. 2. 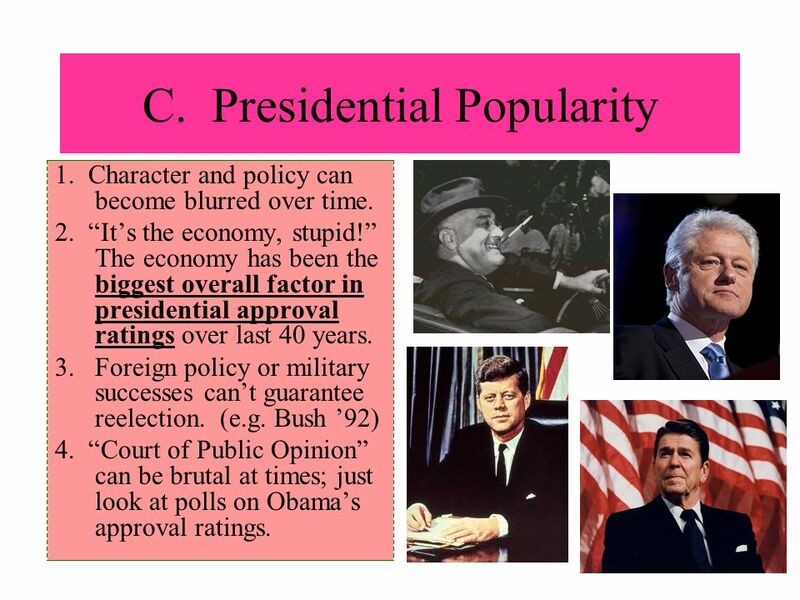 “It’s the economy, stupid!” The economy has been the biggest overall factor in presidential approval ratings over last 40 years. 3. Foreign policy or military successes can’t guarantee reelection. (e.g. Bush ’92) 4. “Court of Public Opinion” can be brutal at times; just look at polls on Obama’s approval ratings. B. 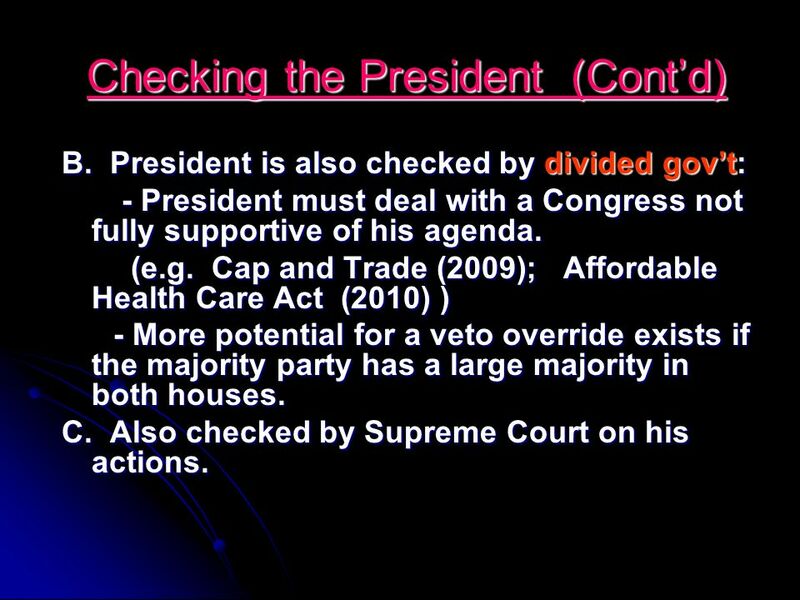 President is also checked by divided gov’t: - President must deal with a Congress not fully supportive of his agenda. (e.g. Cap and Trade (2009); Affordable Health Care Act (2010) ) - More potential for a veto override exists if the majority party has a large majority in both houses. C. Also checked by Supreme Court on his actions. 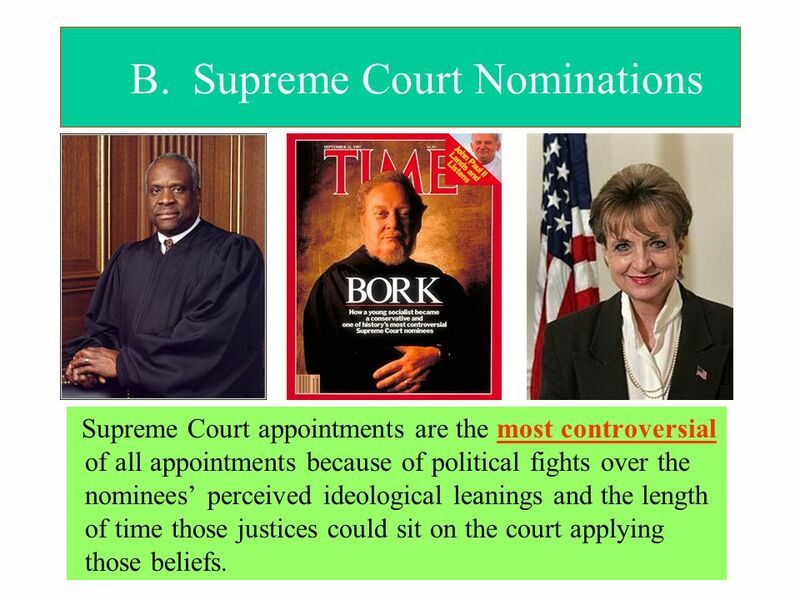 Supreme Court appointments are the most controversial of all appointments because of political fights over the nominees’ perceived ideological leanings and the length of time those justices could sit on the court applying those beliefs. 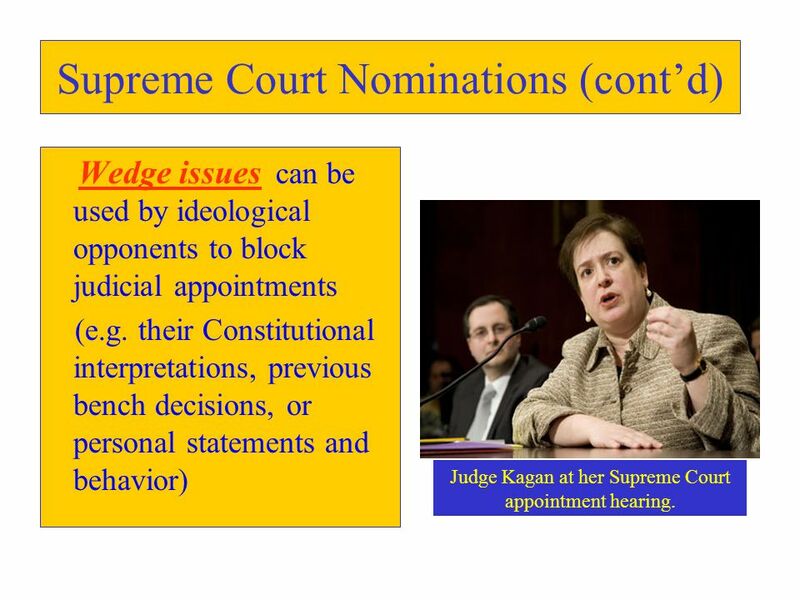 Wedge issues can be used by ideological opponents to block judicial appointments (e.g. their Constitutional interpretations, previous bench decisions, or personal statements and behavior) Judge Kagan at her Supreme Court appointment hearing. 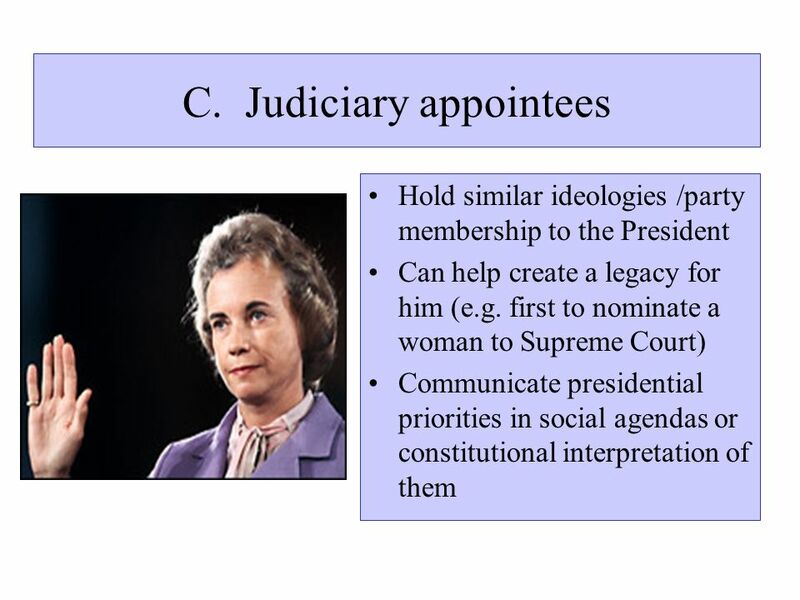 - Extremism in judicial choices can lead to Congressional opposition to those type of appointments. 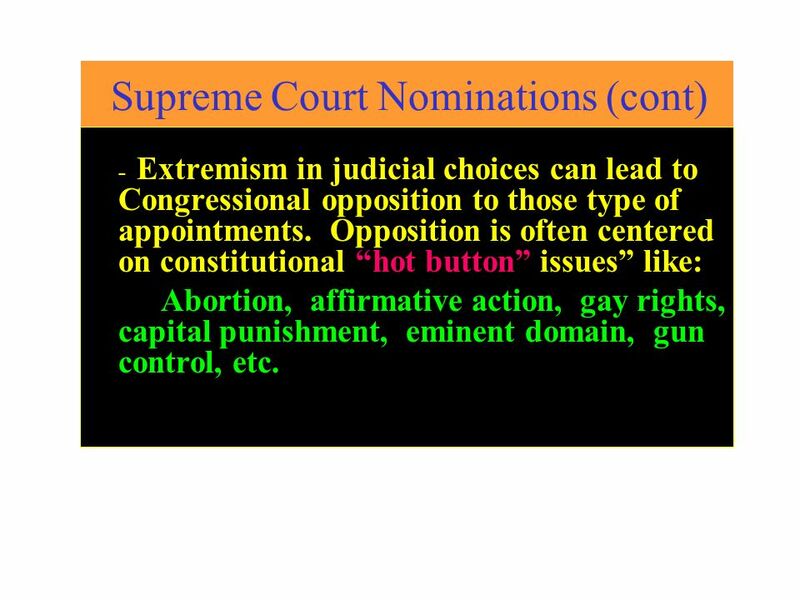 Opposition is often centered on constitutional “hot button” issues” like: Abortion, affirmative action, gay rights, capital punishment, eminent domain, gun control, etc. A. 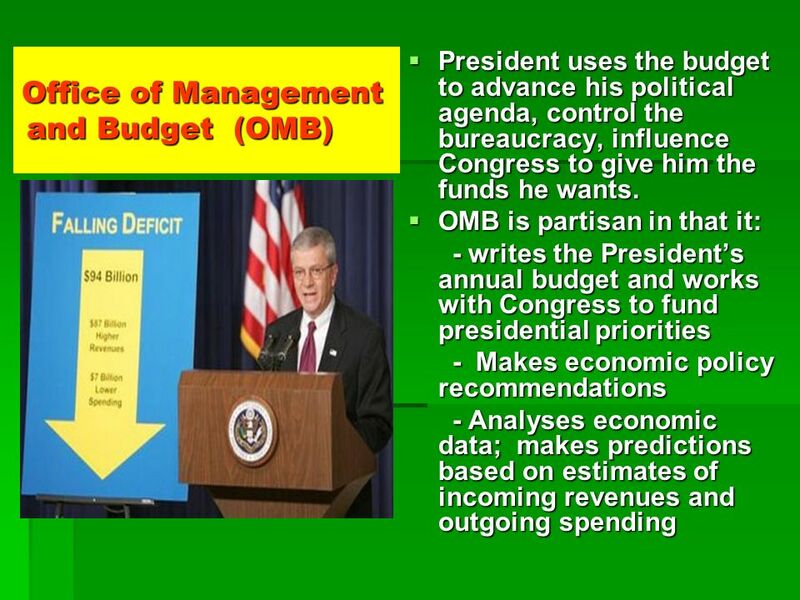 The Cabinet is the President’s main means of formulating and carrying out the President’s policies. - It is not mentioned in the Constitution, but exists through Congressional acceptance & presidential needs. 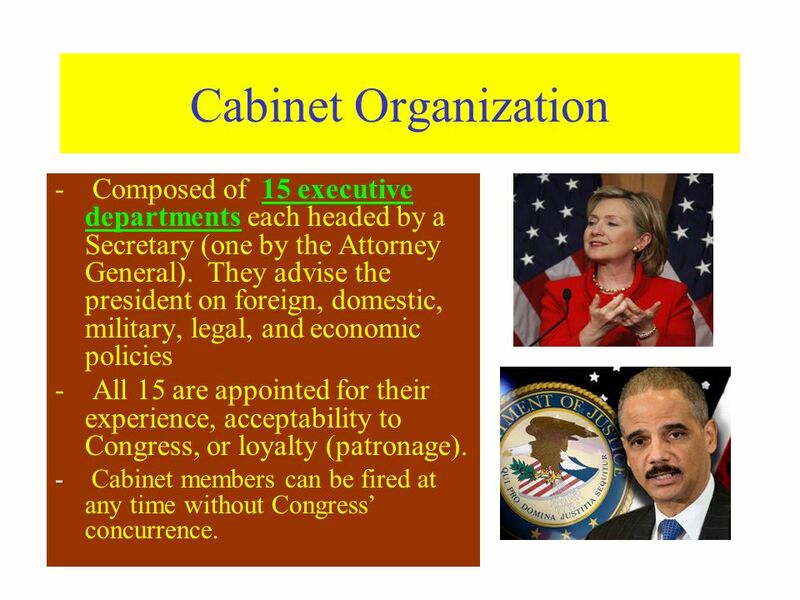 28 Cabinet Organization Composed of 15 executive departments each headed by a Secretary (one by the Attorney General). They advise the president on foreign, domestic, military, legal, and economic policies All 15 are appointed for their experience, acceptability to Congress, or loyalty (patronage). Cabinet members can be fired at any time without Congress’ concurrence. 30 B. 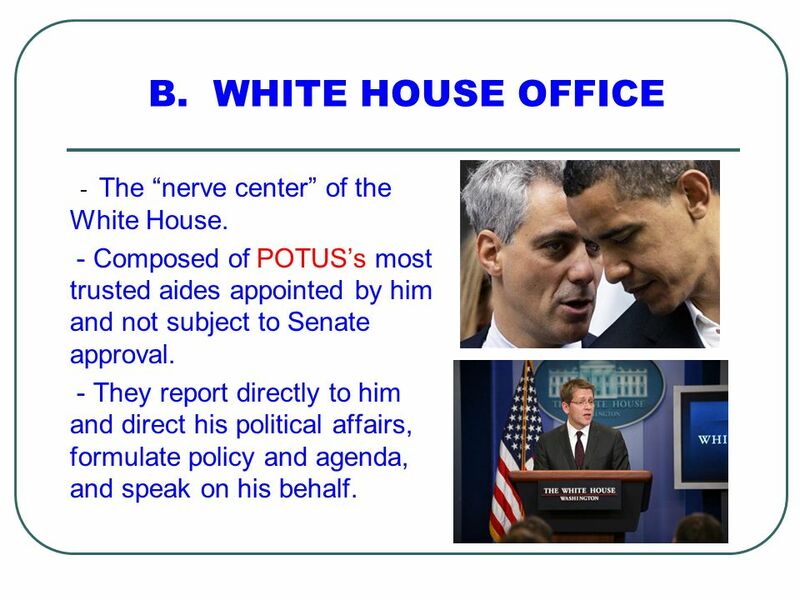 WHITE HOUSE OFFICE - The “nerve center” of the White House. - Composed of POTUS’s most trusted aides appointed by him and not subject to Senate approval. - They report directly to him and direct his political affairs, formulate policy and agenda, and speak on his behalf. 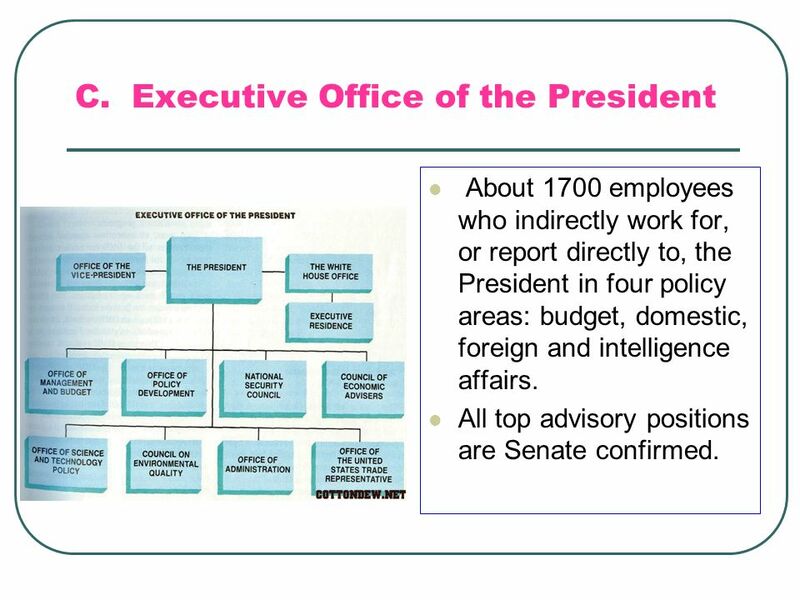 About 1700 employees who indirectly work for, or report directly to, the President in four policy areas: budget, domestic, foreign and intelligence affairs. 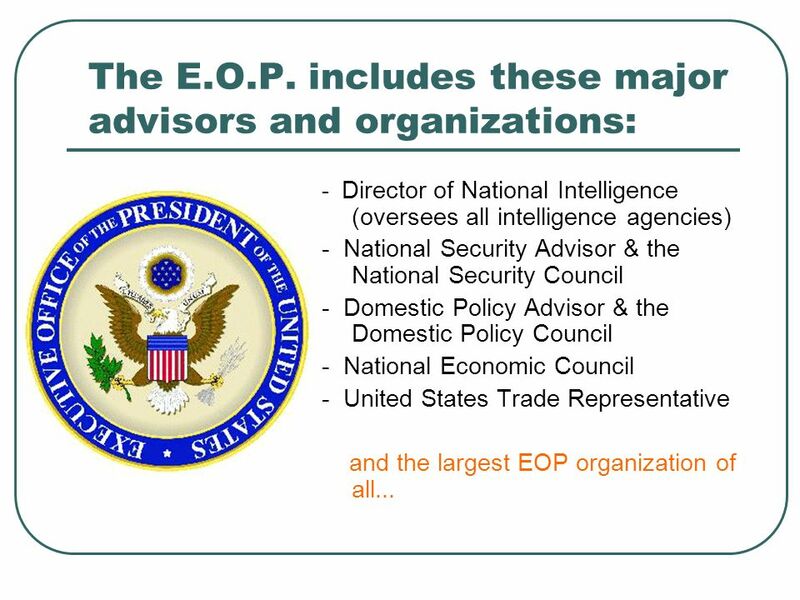 All top advisory positions are Senate confirmed. 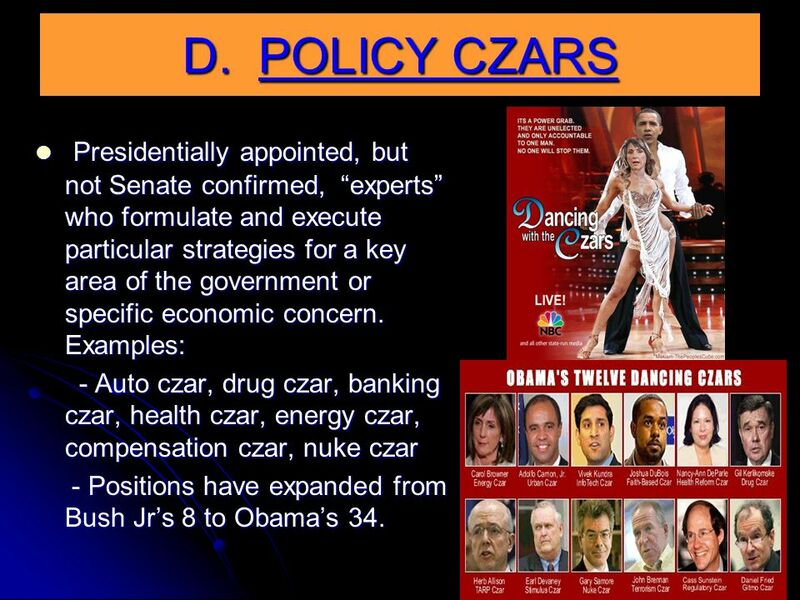 34 D. POLICY CZARS Presidentially appointed, but not Senate confirmed, “experts” who formulate and execute particular strategies for a key area of the government or specific economic concern. Examples: - Auto czar, drug czar, banking czar, health czar, energy czar, compensation czar, nuke czar - Positions have expanded from Bush Jr’s 8 to Obama’s 34. A. 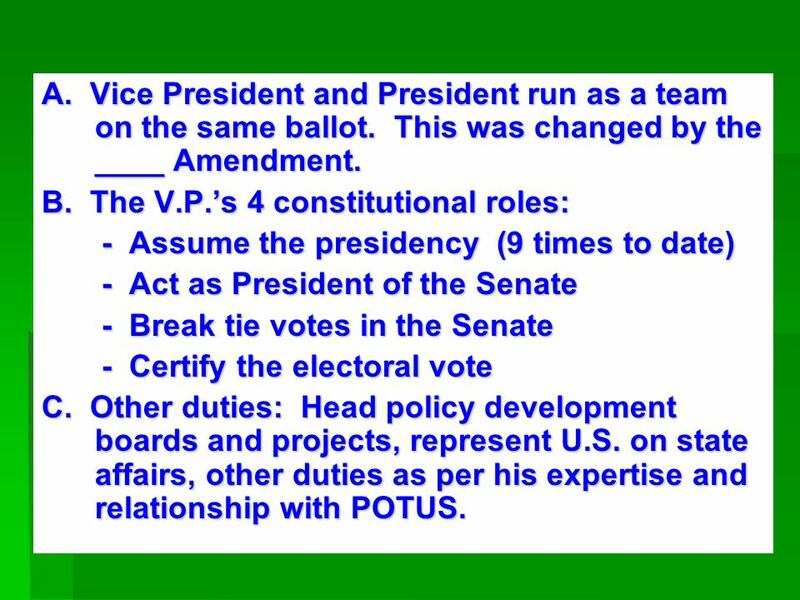 Vice President and President run as a team on the same ballot. This was changed by the ____ Amendment. B. 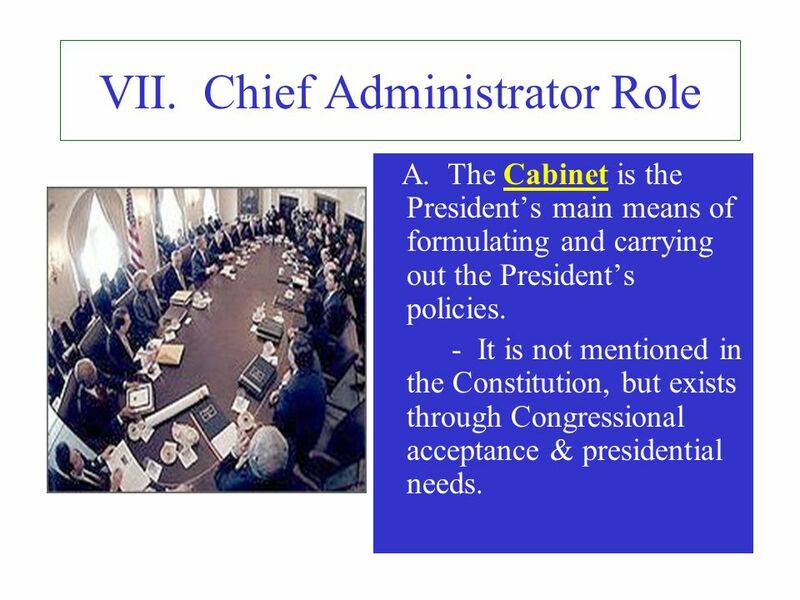 The V.P.’s 4 constitutional roles: - Assume the presidency (9 times to date) - Act as President of the Senate - Break tie votes in the Senate - Certify the electoral vote C. Other duties: Head policy development boards and projects, represent U.S. on state affairs, other duties as per his expertise and relationship with POTUS. Per the 25th Amendment, the V.P. 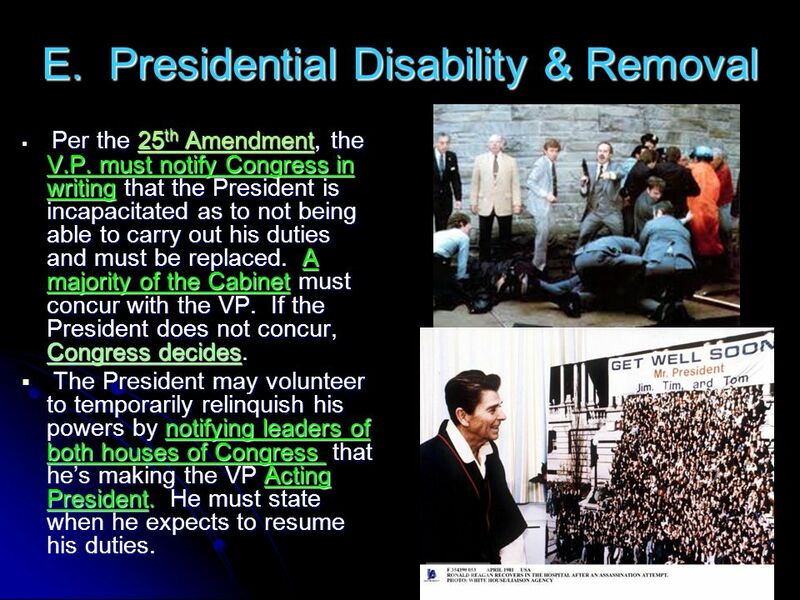 must notify Congress in writing that the President is incapacitated as to not being able to carry out his duties and must be replaced. 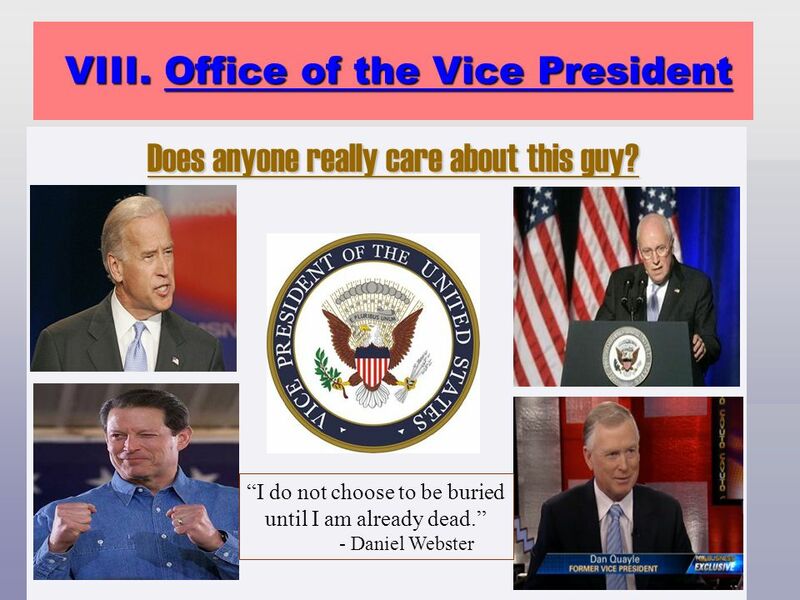 A majority of the Cabinet must concur with the VP. If the President does not concur, Congress decides. 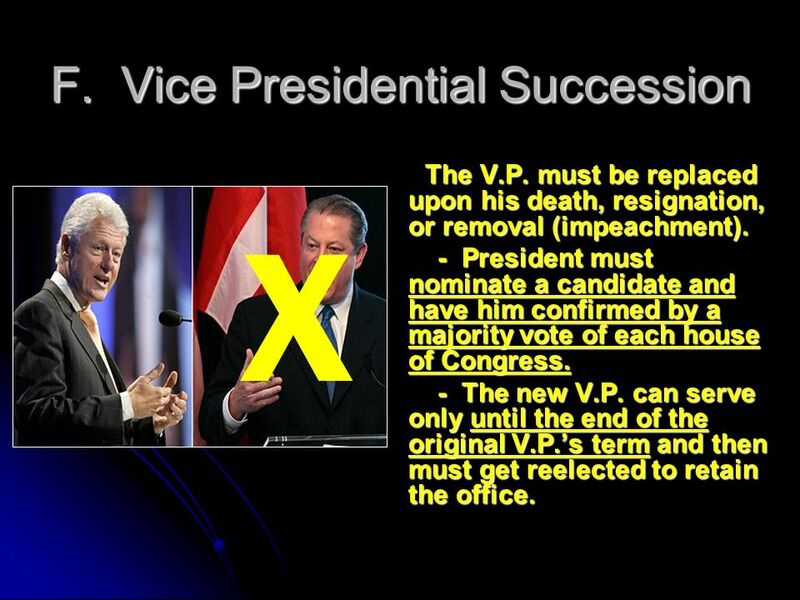 The President may volunteer to temporarily relinquish his powers by notifying leaders of both houses of Congress that he’s making the VP Acting President. He must state when he expects to resume his duties. 40 X. IMPEACHMENT Carried out per Article II, of the Constitution. 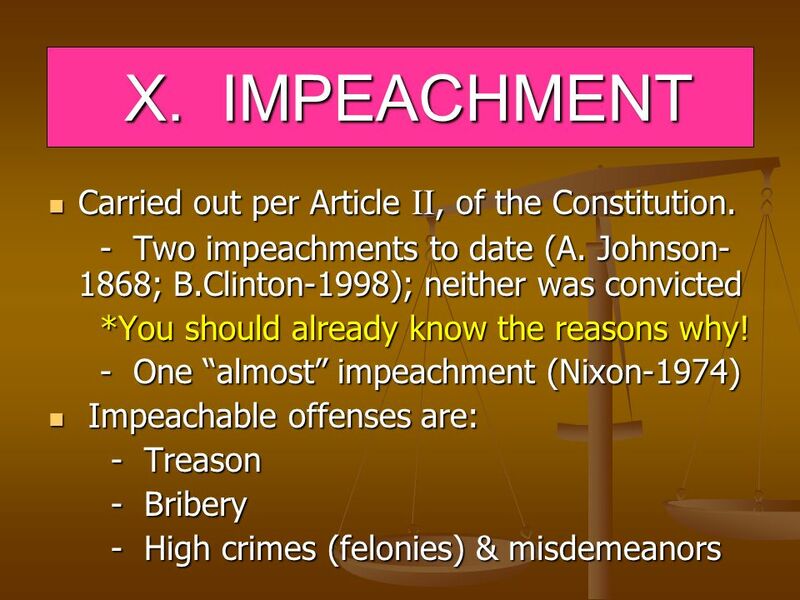 42 Who Decides If Impeachment is Necessary? 1. 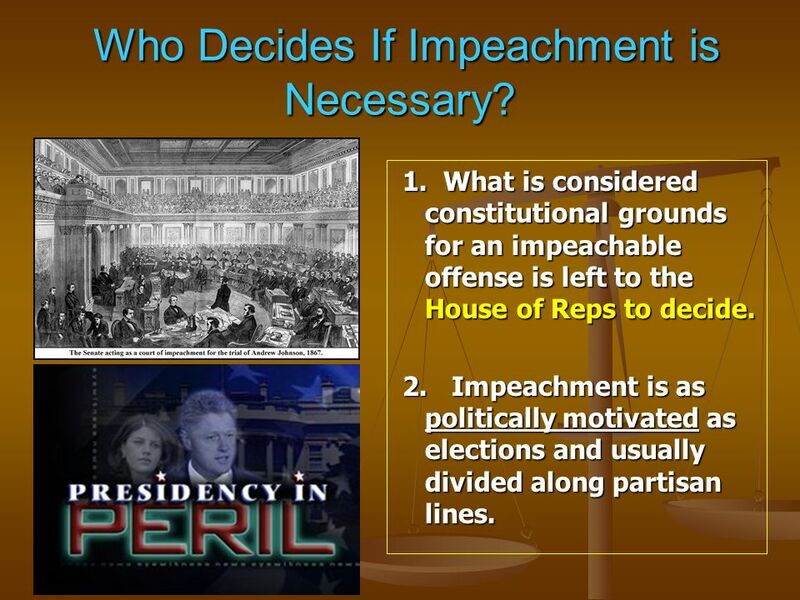 What is considered constitutional grounds for an impeachable offense is left to the House of Reps to decide. 2. 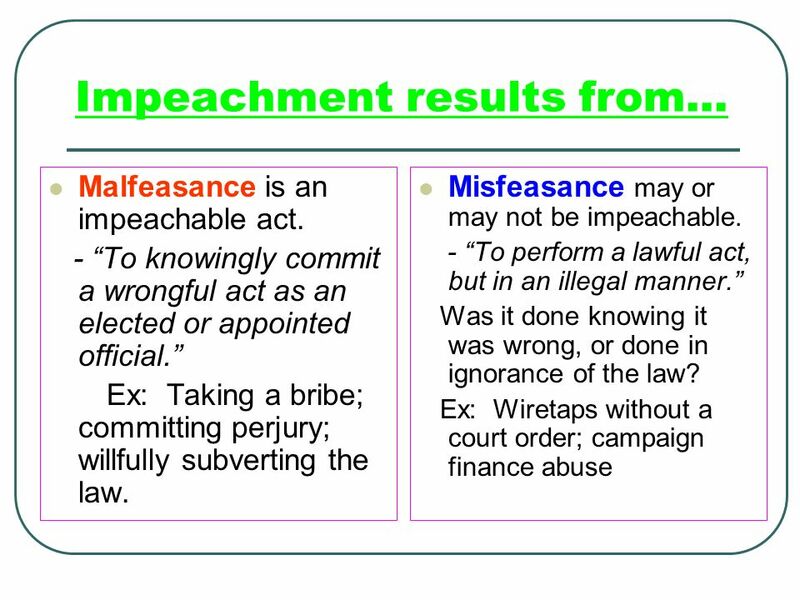 Impeachment is as politically motivated as elections and usually divided along partisan lines. Charges are filed with the House of Representatives. Charges are investigated by the House Judiciary Committee to determine if impeachment is warranted. 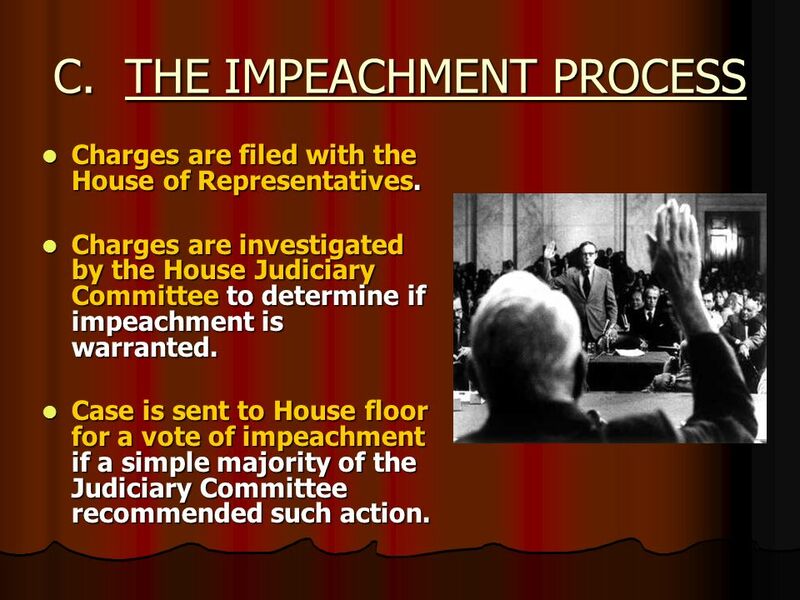 Case is sent to House floor for a vote of impeachment if a simple majority of the Judiciary Committee recommended such action. The full House hears and debates the charges and then votes on impeachment. 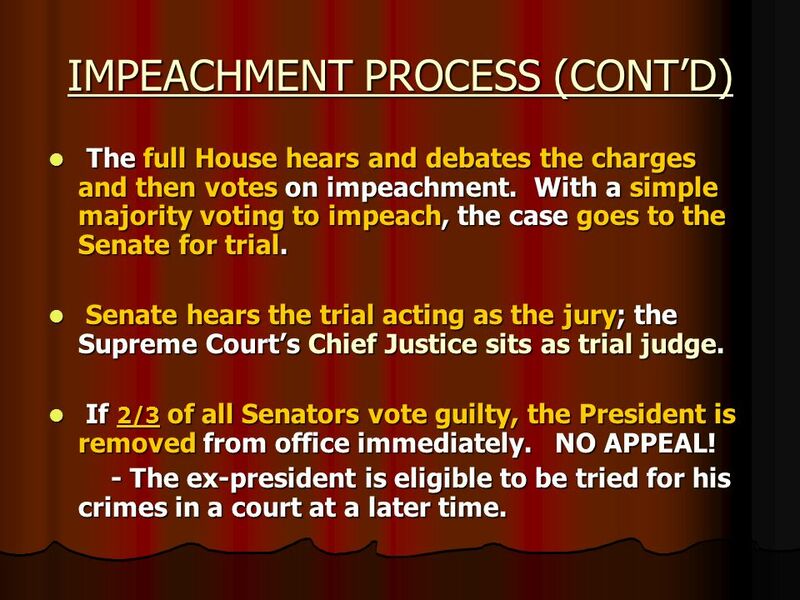 With a simple majority voting to impeach, the case goes to the Senate for trial. Senate hears the trial acting as the jury; the Supreme Court’s Chief Justice sits as trial judge. If 2/3 of all Senators vote guilty, the President is removed from office immediately. NO APPEAL! - The ex-president is eligible to be tried for his crimes in a court at a later time. 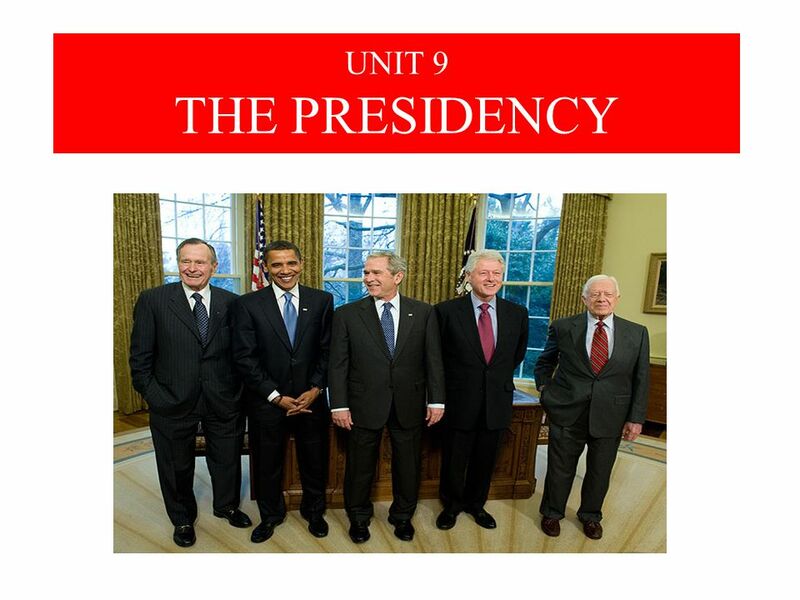 Download ppt "UNIT 9 THE PRESIDENCY." 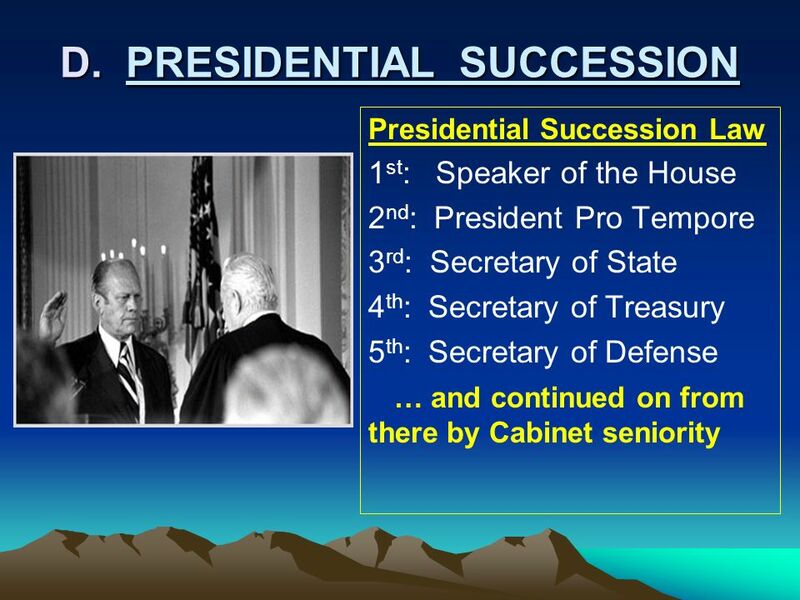 Executive Powers As chief executive, the president has three main powers: appointing and removing of key executive-branch officials, issuing executive. 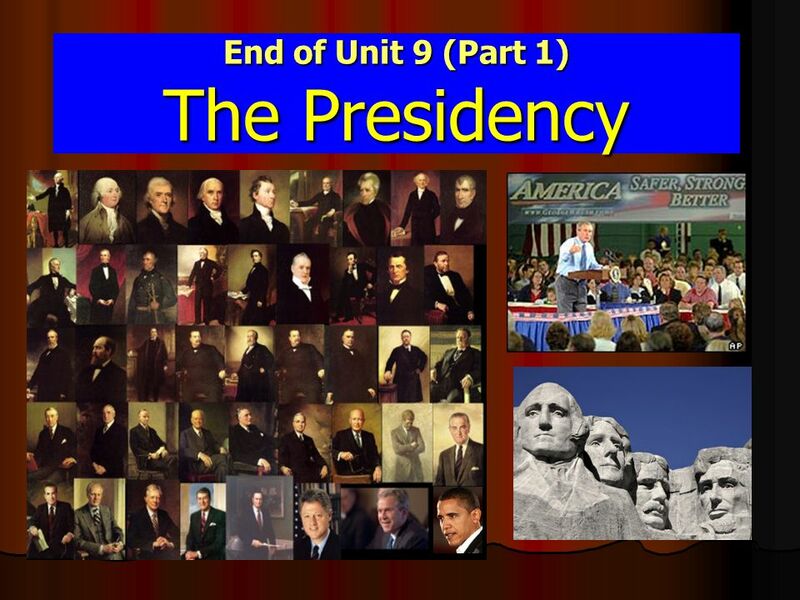 Chapter 10 The Presidency. 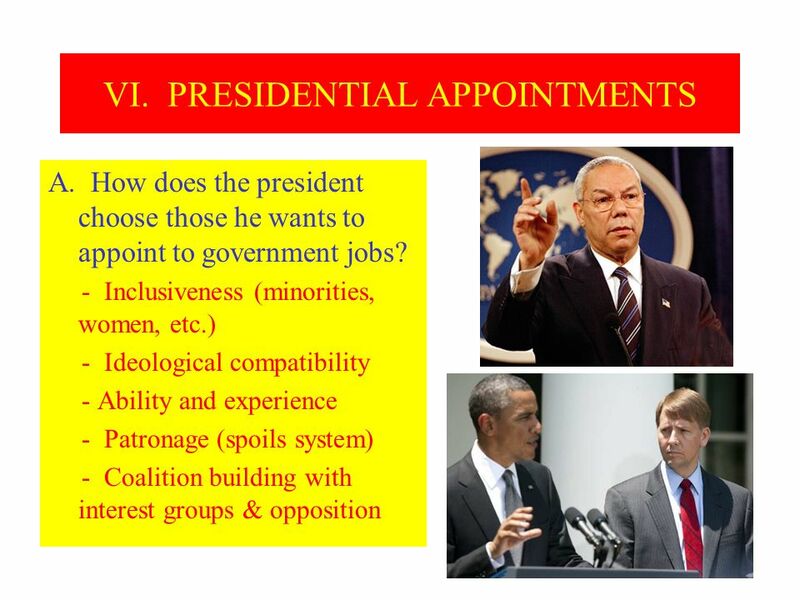 Who Can Become President? 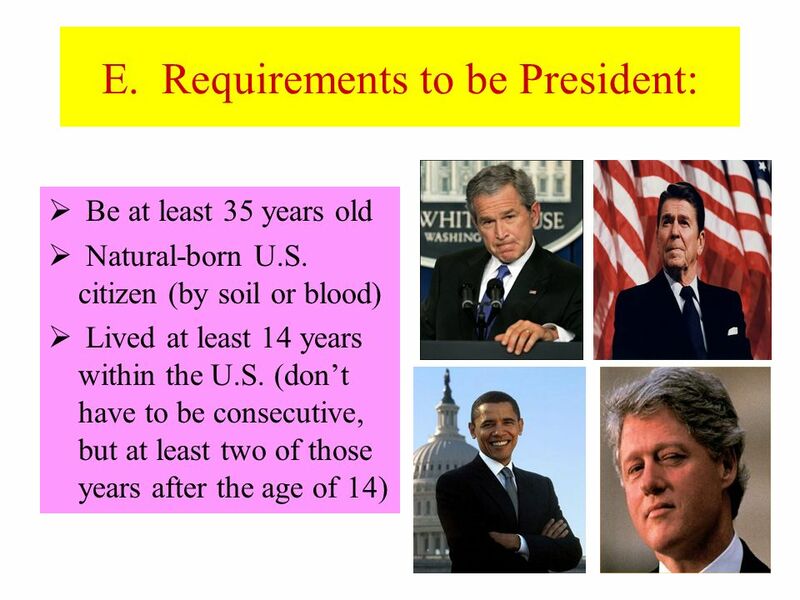 “natural born” citizen must be at least 35 years old must be a resident of the U.S. for at least. ELECTING A PRESIDENT 2004 Presented by Ms. Reynolds. 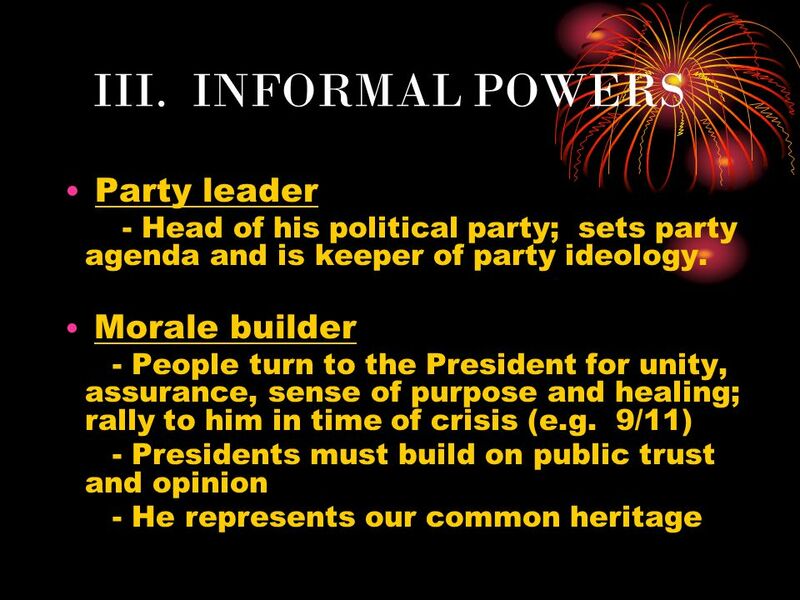 Presidential Roles and Powers. 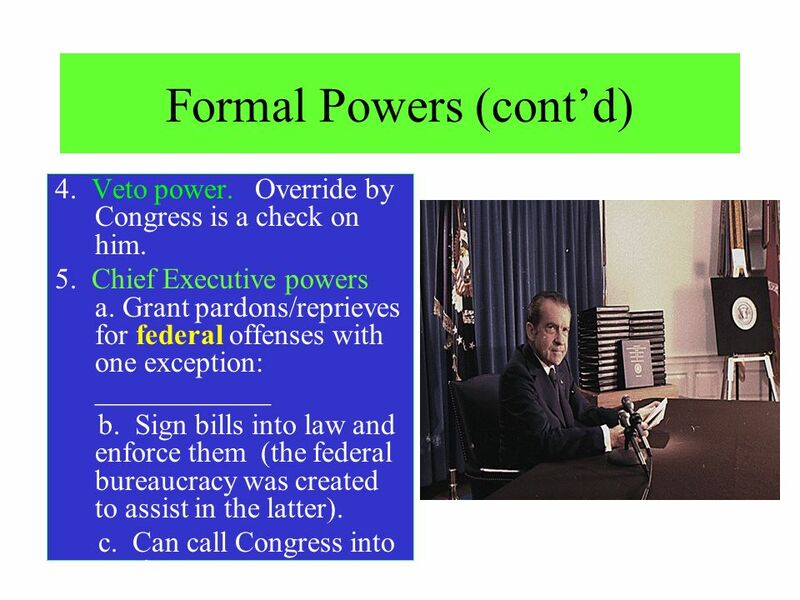 Formal Powers of the President Constitutional or expressed powers of the presidency Constitutional or expressed powers. The Executive Branch. 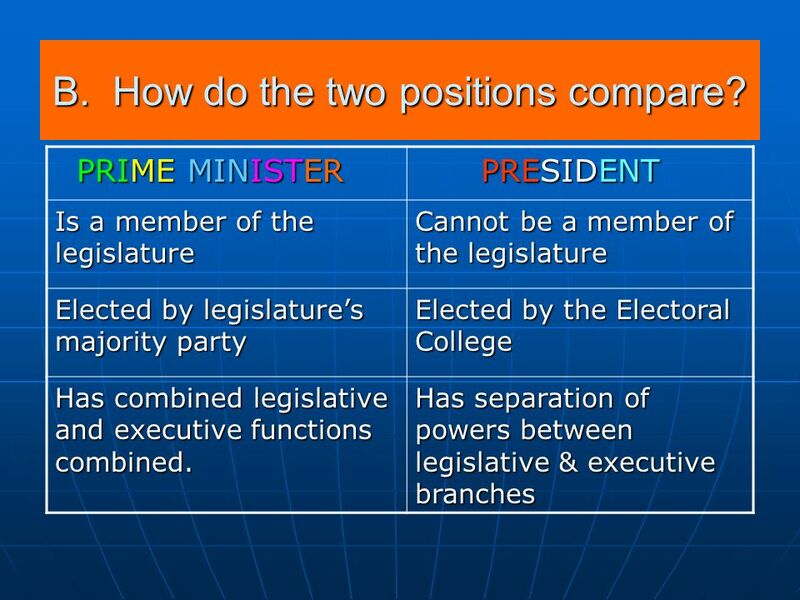  Powers of the Executive Branch are stated in Article II of the Constitution  Commander in Chief  Head of cabinet and executive. The Presidency on Trial Assessing the Limits of Presidential Power. Did not exist under the Articles of Confederation Americans wanted one elected person other countries could identify and respect They didn’t want someone. 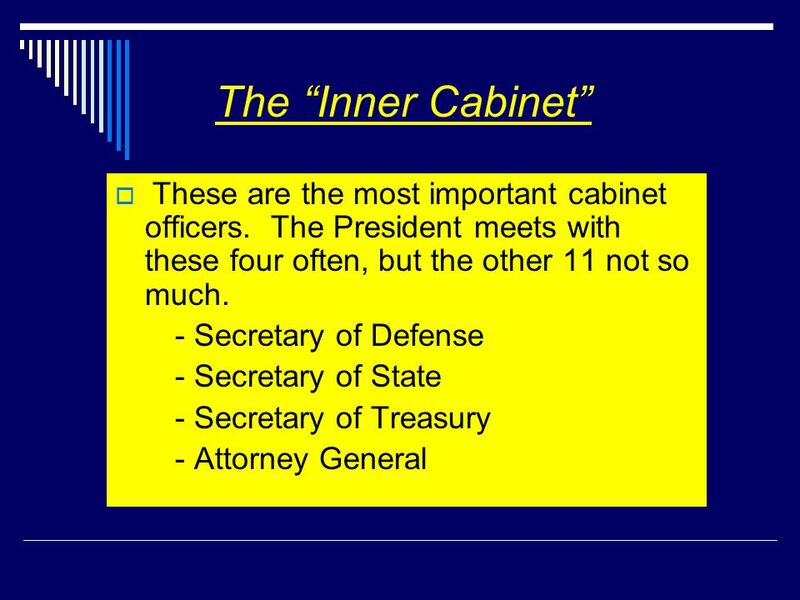 2 pt 3 pt 4 pt 5pt 1 pt 2 pt 3 pt 4 pt 5 pt 1 pt 2pt 3 pt 4pt 5 pt 1pt 2pt 3 pt 4 pt 5 pt 1 pt 2 pt 3 pt 4pt 5 pt 1pt Succession Federal Bureaucracy Roles.